Utah locals Quiet Oaks have released their first-ever full-length album after a lengthy, highly anticipated wait. Their EP, Put Your Dreams Where They Belong, debuted back in September of 2015. After refining each individual, creative detail, Quiet Oaks decided it was the opportune time to release a full-length a year and half later. 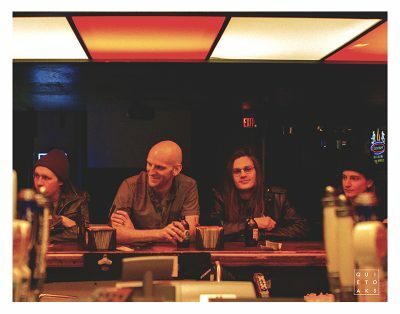 The local band has become a staple at SLC’s venues, gaining quite a ritualistic following. It’s no wonder, since the bandmates perform an explosive, enigmatic live show. Many of those same fans and friends had been waiting for Pretty Alright to hit the airwaves. The vibrato in Dane Sandberg’s voice echoes throughout Pretty Alright. Sandberg’s vocals are often the main attraction on the tracks, highlighted by bluesy guitar parts and flickering keys. “The Go Getter” gets the record started with an upbeat nature that sets the tone for a number of the tracks. Spencer Sayer’s hi-hat chimes playfully in the background, never missing a beat. “Keep It Together” rises like an anthem out of the ashes as Sandberg screams, “It’s all for you honey / I’ll keep waiting for you to break my heart again.” Keyboard parts add vibrancy to the muted “Let Me Ignore You.” The lyrics are especially haunting. Sandberg sings, “Just let me destroy you—let me decide what I want / I could adore you, but I’d rather see you rot.” How often does love destroy us instead of building our senses of self up? It seems cliché, but the lyrics speak volumes to the doomed reality of love that many won’t admit. Quiet Oaks refuse to end the album quietly. In contrast, they wrap up Pretty Alright with “Guns,” the most dynamic track on the record. The piano, combined with an intoxicating bassline, plays like a spitfire stoking Sandberg’s flame. And just like that, Quiet Oaks explode with their debut LP. Pretty Alright is both polished and exuberant. There are moments when the instrumental parts could come further to the front of the sound, yet the vocals deserve much of the spotlight, which they certainly have. Time was good to Quiet Oaks—the wait has proven to be worth it. They have created an LP that focuses on their strengths, curating something that many bands don’t get right on their first full-length go-around.